A decorative pillow I made for last year’s live auction. I have feathers floating through the air of my home, my living room looks like the day after Black Friday at Filene’s Basement and my neck has a cramp in it. 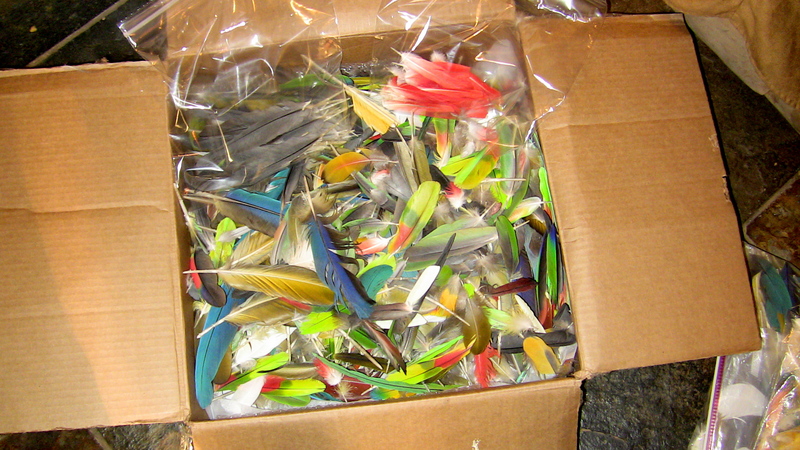 This is how some of your feathers typically arrive. I have to sort this out by color and species. The Houston Parrot Festival is coming up and I’ve begun making the pillows and scarves destined for auction to raise money for the NPRPF, which, if you don’t know, is an acronym for National Parrot Rescue and Preservation Foundation. That’s a mouthful! But they do great work in Houston. 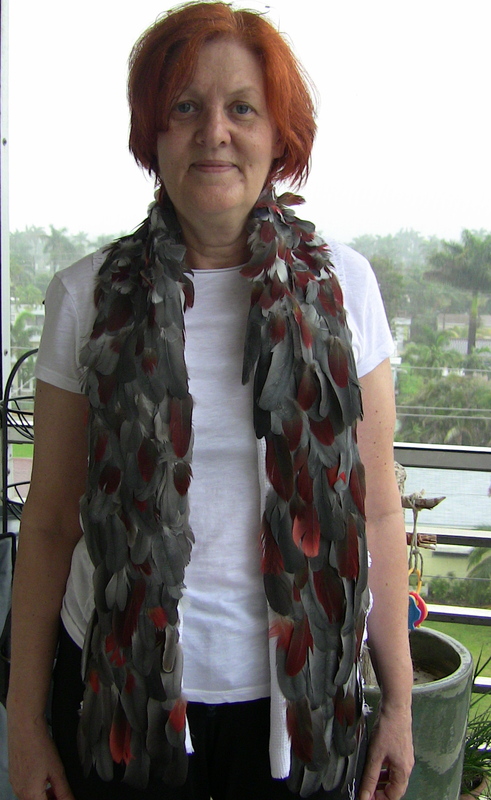 A little “Skinny Scarf” composed of African Grey and Eclectus feathers. 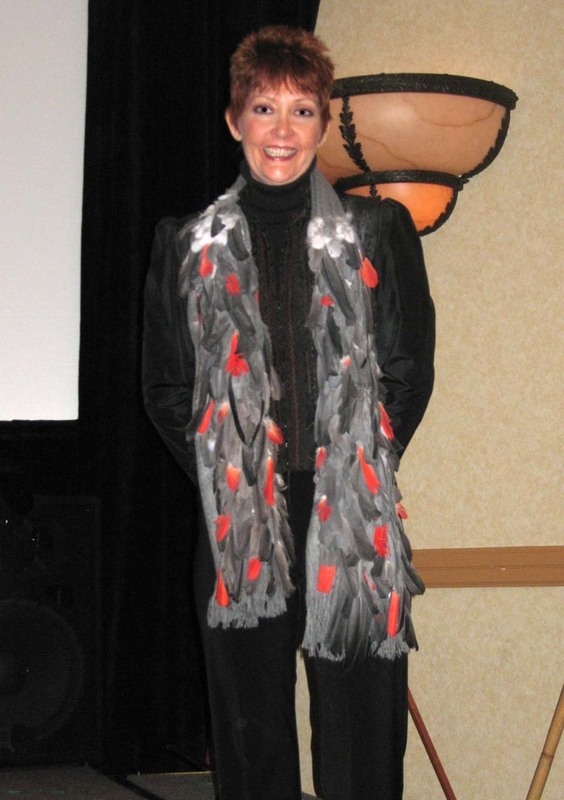 The Scarf that launched a tiny fund-raising industry. It’s not easy. If it was easy, you’d see these things all over the place. I thought that after the first year, when everyone saw that first scarf, that there would be feather items all over the place. No so. And I was very surprised. But then I thought about it: It took me a while to get the hang of it. And I’m still learning what looks good, what works and what is simply dreadful. It’s also very labor intensive. If you don’t have the patience, you are going to wish you never started the project. It’s frustrating, messy and you have to make it up as you go along because no two feathers are alike. It’s like fitting together a puzzle and you have no photograph to go by. The other reason I think people don’t do stuff like this is because they can’t quite figure out how I do it, even after I’ve explained it. And so I keep on with your generous donations of your feathers. Whether they arrive in an envelope, a baggie, a box, tin or shopping bag, it simply doesn’t matter. I generally use about 95 % of what is sent to me in one way or another. Unless the feather is completely mangled, it gets used. So keep saving those feathers because I can turn them into something that will raise money for something we can all believe in: Parrot Adoption. Thank you so much, Concetta. It’s just what I can do to help parrot rescue non-profits. Please tell us where to send our feathers, Patricia. I’ll send you an email Audrey. Thank you! Patricia, I have Pionus and Amazon feathers I have been saving for years. Please tell me where to send them to you. It’s a done thing, Judy. Thank you! I love the cause and the pillows. Where can I get one? If you’re willing to share some instructions, I would love to make one of these. I will never be able to buy one as I live on disability and have a very low income. All of these items are absolutely GORGEOUS! I personally think the pillows are even more “practical” than the scarves because they would be so easy to display. 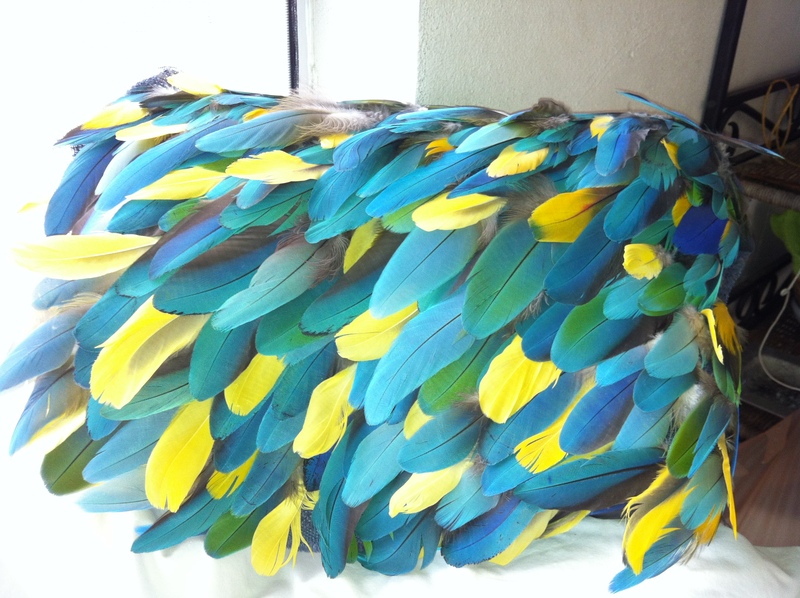 The blue & gold pillow is especially stunning! 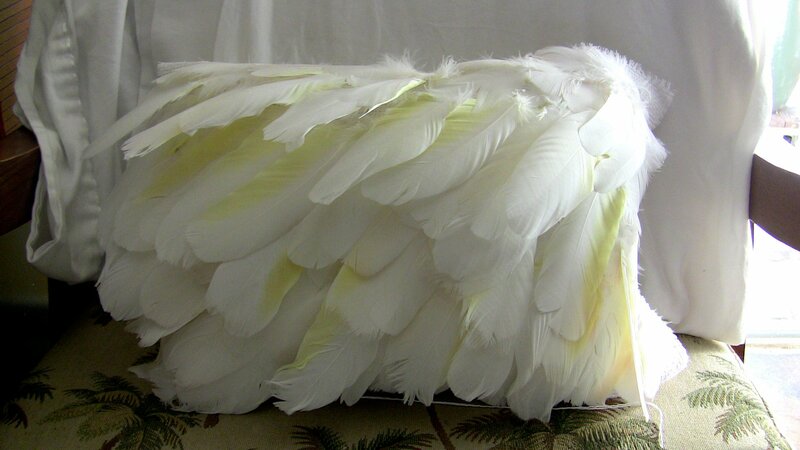 I also think these projects would be lovely for bereaved bird owners to make (or perhaps have made as custom projects) using the feathers of their beloved deceased bird. My husband and I recently lost a dearly beloved rescued milligold macaw named Chloe, and I have also lost my first macaw, (a blind rescue ruby macaw named Berta) but of course we have saved all their feathers for many years now. 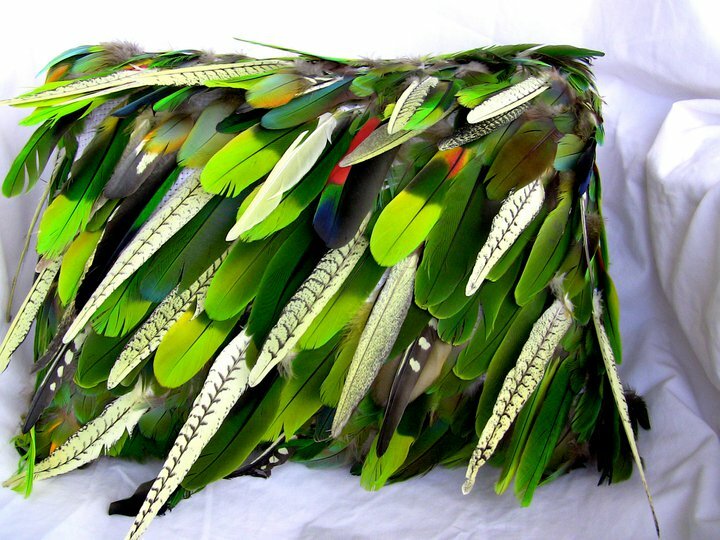 I would love to be able to make a commemorative pillow out of each bird’s feathers and I’m sure other bereaved parrot owners would feel the same way. This is a very beautiful way to display any bird’s feathers! Do you have a YouTube channel or a website where you could put up a demonstration, DIY video to show people what to do? If it was a website where you could get advertising revenue, then your demo of how to make these items could potentially generate income year round. I think Many people (including non parrot owners) would be Very interested in your methods for making both the pillows and the scarves. DIY videos are very popular with a wide range of viewers.